How do we honor the life we end up in? How do we stay vital and creative in the face of disappointments and regrets? I’ve had the honor of creating and leading ceremonies for adults in their prime and those approaching elder status seeking to embrace this life milestone with greater intention and the support of their community. Mid-life transitions – such as divorce, career change, assuming caregiver status for one’s parents – deserve attention and support. We can learn much from the cultures that honor the stages of mid-life and elder years through rites of passage ceremonies. A transition ceremony can help transform an unmarked passage into a threshold-crossing rich with meaning and connection. “Holly’s bright, calm, and inquiring presence helped me open and engage at a time of deep personal transition. Holly is impressively skilled in drawing out the essence of what needs to be celebrated and then organizing that essence into meaningful and beautiful ceremony.” ~ Bill B. “The ceremony was profoundly transformative for me in ways that were evident not just in the moment but in the hours and days that followed. It was a huge symbolic moment, a marker, a point that I can now turn to and reference. The image of all my dear friends, their smiles and expressions of compassion as we sat in the sunlight, will be forever imprinted in my mind.” ~ Laura K.
“I've never before had the support of my community in such a potent way when moving to a new place. It makes a huge difference in feeling like I am cleanly severed from my role in my previous community and yet I’m not alone. 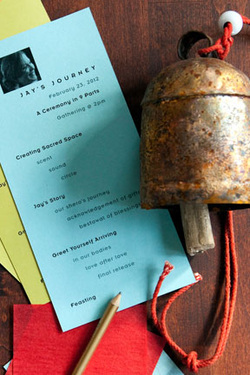 This is a fine balance that only the intentionality, witnessing, and collective nature of ceremony can create.” ~ Jay F.